My apologies for the delay of this posting, but I have been offline for the last week or so. This will be the final weekly post as my South American journey draws to a close, and I make my way back to Canada. Kind of cool that it is also my 100th. When I last left off, I had spent my first night singing with an excellent band at Smiley’s in Pedasi, Panama. With time running short, I felt I had to keep moving and cram as much as I could into my final days. Although rewarding, moving and packing up day in and day out is very tiring, and I was feeling worn out. Another surf beach beckoned–Venao Beach–but I just did not have it in me. In the end, I decided to stay put for another day and night in Pedasi. And that allowed me to discover this sleepy little beach town. Pedasi is not actually on the beach, but several are within a few kilometres of the small town of about 2,000 people. I rented a bicycle on Wednesday and headed North-East through the rain to Ariel Beach. I was reminded that I was in the tropics on the way as I biked past a 5-foot snake that, luckily for me, had been previously run over. Ariel beach was deserted, except for a few fishermen cleaning their morning catch. 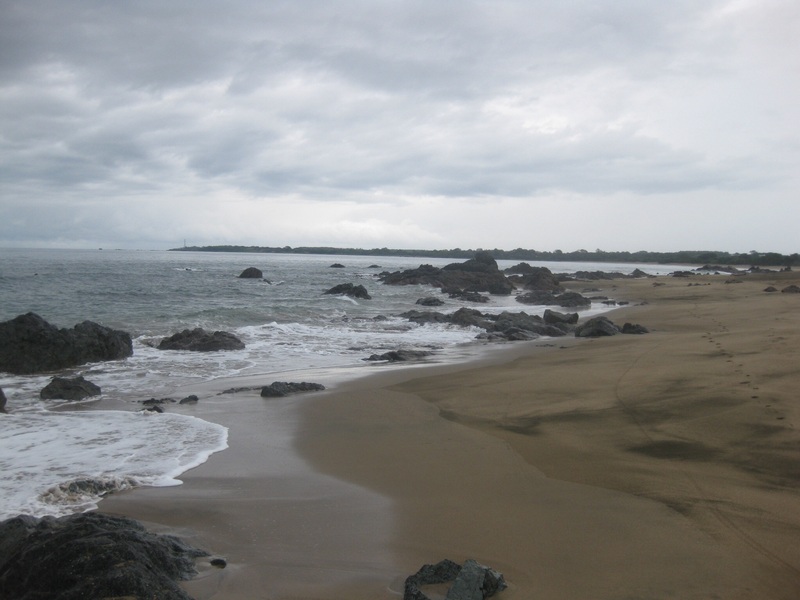 I then biked South along the sand to El Toro beach, even more deserted and unremarkable. Definitely no surf here. 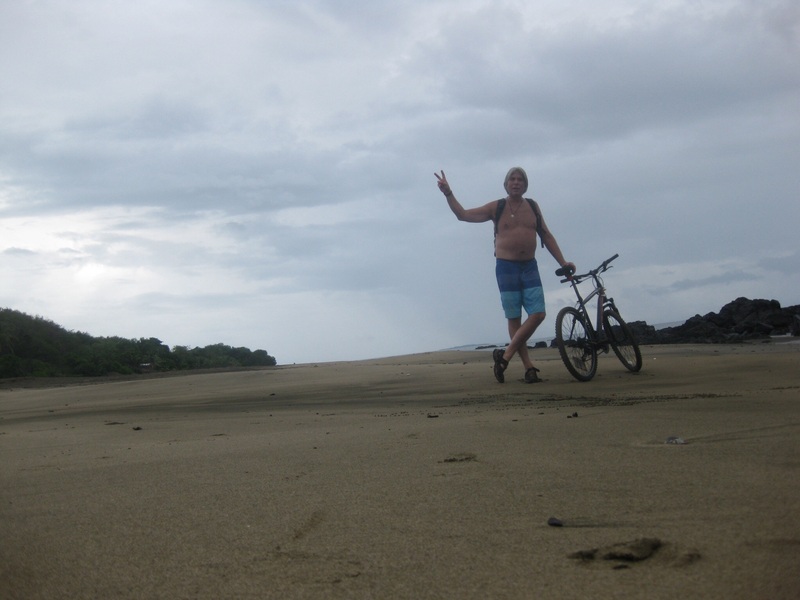 Then back to the road, and another 20 minutes of mountain biking to an out of the way beach called La Garita. Spectacular and completely deserted. I spent the rest of the day resting and recharging. I returned to Smiley’s for lunch. It is great little restaurant owned by an American, and attracts many expats who have made Pedasi their home. Really great food, and laid back atmosphere, but there was something gnawing at me. 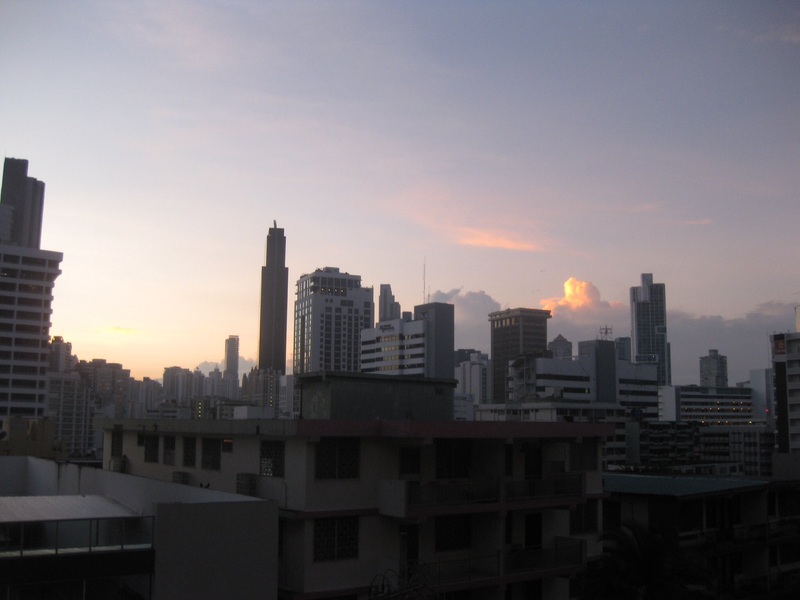 It felt very strange to be in the unfamiliar surroundings of Panama, yet surrounded by non-local people like me. I have felt this expat aversion many times before. I haven’t quite figured out what bothers me so much about it. I decided not to return for dinner, and instead found a small, quaint place called Bienvenudush, run by a very friendly Israeli woman. Little touches of love and caring were evident everywhere, and it felt safe here. After six weeks on the road, I had not had a salad. I just couldn’t trust the preparation of them. But she prepared a beautiful, fresh, and very interesting salad for me along with a yogurt based dip that was bursting with flavour and freshness. At $20 it was the most I had spent on a meal in six weeks, but worth every penny. I had not realized until then how desperately my body was craving fresh veggies, and my stomach felt more settled that it had felt in a very long time. Pedasi was a very special place, with a comfortable, chill flow. Care and attention to detail were everywhere–the people, the food, and the way of life–and I really enjoyed spending time in this bubble of “normal” life for a short while. I met an older Italian man at the hostel, and for the first time since the beginning of the trip, I was able to easily understand his Spanish. His pronunciation was exquisite, his speech slow and easy to follow, and it felt really good not to be struggling to follow the language. The next morning I packed up, grabbed some snacks for the road from a local Canadian-owned bakery, and began my trek to Panama City, just catching the collectivo before it pulled out. I jumped on the bus, out of breath and discombobulated, and all the locals on the packed bus seemed to get a kick out of this, and watching a 6′ 3″ gringo try to maneuver his way into the cramped space! Open, vulnerable, and not guarded…people universally seem to respond to this. It was a much different vibe compared to the bus ride to Pedasi only a few days before. I then transferred to a bigger, but still very cramped 5-hour ride from Las Tablas to Panama City. When I finally arrived, the bus terminal looked less threatening this time around. I checked into Hotel Milan in the city centre area of El Congrejo. It was without question the nicest accommodation I have had in the past six weeks. More than the $15-35 I have been used to, but still very reasonable at $65 in downtown Panama City. Right off the bat, I felt really good in this city. Odd because I don’t really like big city life. And it felt really good to be back to “civilization” as I know it. I have been living very modestly (and happily), so it was surprising how much I enjoyed having some of my creature comforts back, things I usually just take for granted: toilets that flush everything, ice, good and safe food and water, salads, wine, hot water, a nice towel, AC, reliable wi-fi, clean streets, decent drivers, and the list goes on. I had adjusted to a different lifestyle, and didn’t realize how much I missed some of these comforts. But people are still crazy about using their car horns here, as they have been throughout South America. It is so unnerving, and continues to rattle me. But there is something else here. It is a big city, but it does not feel big. It feels relaxed, spacious, cosmopolitan, and friendly. I also really like the way it looks, and the thought that has gone into how it looks at night. It is known as a “beta” world city, an interesting term I have never heard of before. A world city can be designated into alpha, beta, and gamma, based on decreasing impact, importance, and influence on global finance and trade. I wandered around this neighbourhood and quickly spotted a perfect place to settle in and watch Panama go by. Farley’s Piano Bar. Wonderful staff who made me feel very comfortable. Although they didn’t quite seem to know what they were doing, they were open to suggestion, and eager. 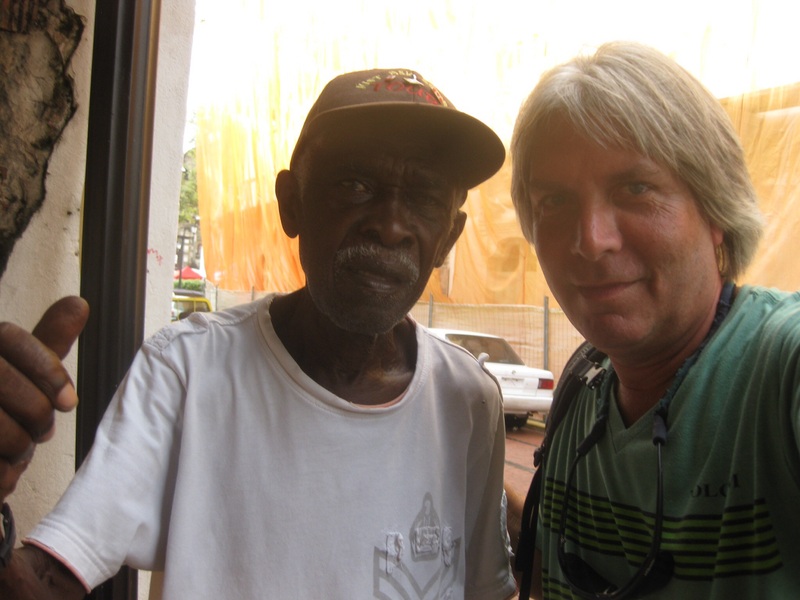 I was then approached by a very interesting older American/Panamanian couple who chatted with me about the virtues of Panama City, what to do, and suggestions for dinner. With so many seemingly excellent food choices, I was excited to have a nice meal. I walked into a very cool looking place, most definitely underdressed, and enjoyed an equally cool reception from the very well-dressed staff. I have been wearing the same 2 or 3 outfits for weeks, none of which are dressy. But I didn’t care. I may not have looked like I belong, but I felt like I did. I had a beautifully prepared piece of fish and veggies. No rice or potatoes or chicken…what a relief! And I appreciated how well the wait staff practiced their craft. Then back to Farley’s for a night cap. I noticed an interesting looking guy who had been there earlier and he recognized me. Bill from New York, who was sitting with Luis the Panamanian. Bill approached me, learned I was from Canada, then went to alert a friend of his at another bar who is also Canadian…Jean Galipeau from Montreal, and he came over to say hi. In fact, I have been stopped several times in the first few hours by people who seemed genuinely interested. And that does not usually happen. I am usually happy to just fly under the radar. I had not tried to actively connect with anyone, but it all seemed to be coming to me. Is it the people? Or is it my own energy that is attracting them? Not sure which, but I can definitely feel a shift. On Friday I spent the day cruising around the city, getting the lay of the land. I visited the Panama Canal, a wondrous feat of engineering. More than 20,000 built this 100 years ago, many of whom died during its construction. I was lucky enough to watch a ship go through the series of locks while I was there….dropping 18 feet in 8 minutes, with only about 24 inches clearance on either side. Very impressive to see this live. Check out this clip of a cruise ship moving through it. On Saturday, I toured the city again on one of those hop on hop off buses. They were supposed to come by every hour, but this one was an hour late. 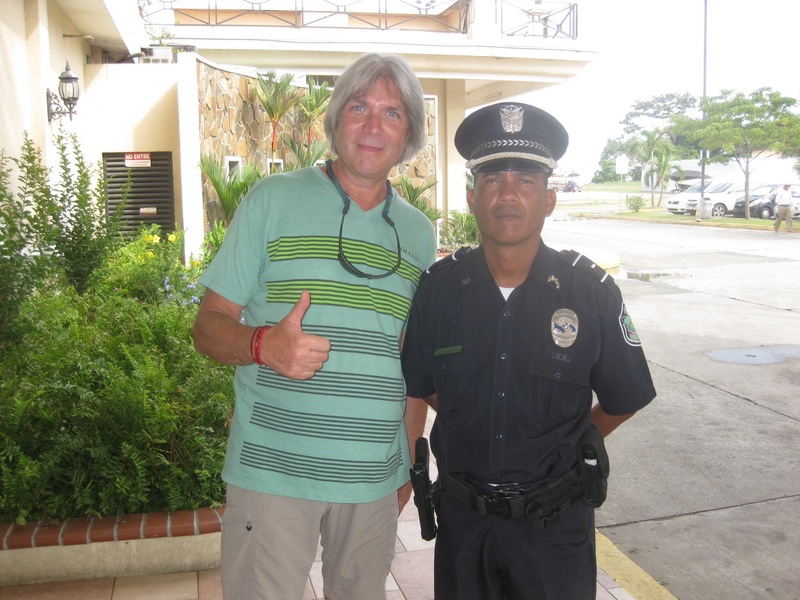 I spent the wait time feeling fairly relaxed, and befriending yet another policeman (as has become my custom on this trip). One of the other waiting passengers, an older man, asked me in Spanish why I was so calm. Although I didn’t feel particularly calm, I felt that there was nothing I could do, so I suppose I let the frustration go. “You need to fight,” he said. “But fight who, I answered?” Here is a clip on the bus. With Conrad in the old town. I made my to Casco Viejo, the old town, established hundreds of years ago about 8 km west of where the city used to be before Captain Henry Morgan (yes the guy on the rum bottle) burned the whole city to the ground. 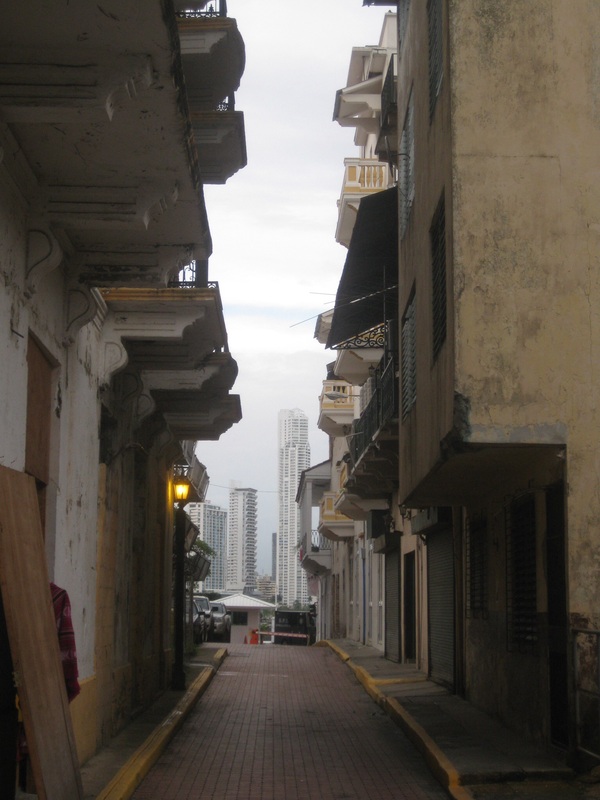 Like the rest of Panama City, what I have seen anyway, the old town was laid back and relaxed, in its own little world. As I was having a beer, an older dude came and sat down with me, Conrad. He spoke English, and was extremely sharp, articulate, and well versed. 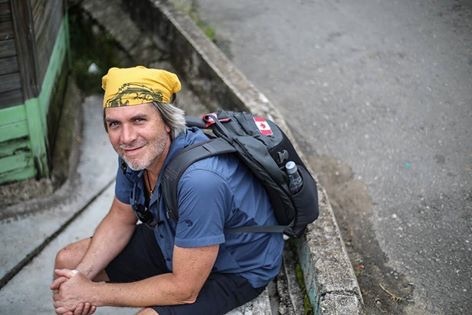 He talked to me about all kinds of things, including what to pay for things, where to find the best mojito in town, politics, Canadians, Panamanians, Americans, Quebecers, what constitutes a gringo, the fact that locals don’t wear shorts, etc. I think he was a walking tour guide, but he didn’t ask me for anything. And I was happy to give him something. He was 78 years old, but I swear he didn’t look a day over 60. A very cool and unexpected little interaction. Old and new, in harmony. There is a relaxed, comfortable, and laid back feeling in the old town, where I wandered around, sang with a street musician, enjoyed the best mojito I have ever had, and tried to soak in the history. And the fact that you can see skyscrapers in the distance makes for a very interesting juxtaposition of old and new. 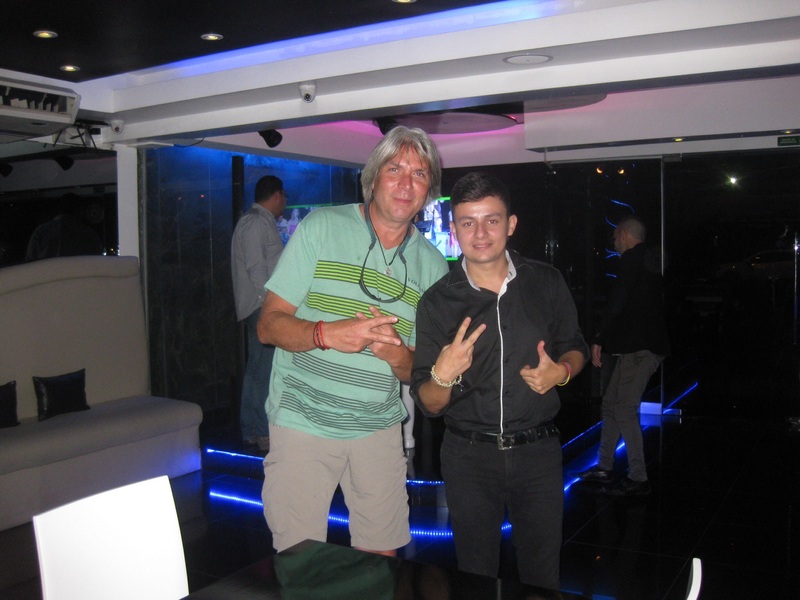 With Manuel, at Farley’s Piano bar. I returned to my little piano bar, and Manuel offered me 3 for 1 happy hour, and asked the chef to prepare an off-the-menu langoustine dish that was out of this world. Over the three days I was in Panama City, he made a very special and constant effort to make me feel at home, which I am very grateful for. 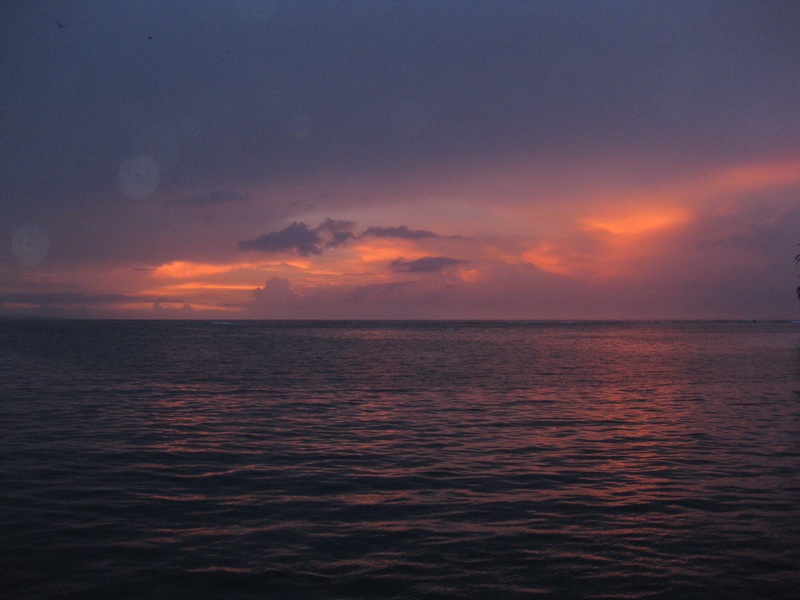 It was the first place I stumbled into just after arriving in Panama City, and I felt at home here right away. And with that, my solo journey was quickly drawing to a close as I prepared for a flight to Florida, and then onto Toronto and back to Ottawa. So far, the return to “normal” is very strange and jarring, and I’m not quite sure where I belong: the cold, the snow, the humanity, the language, Christmas, the complete abundance of everything, and the familiar. I need some time to reflect on the past 2 months, and digest everything I have been fortunate enough to experience, and figure out how to incorporate what I have learned into everyday life. I will post a final wrap up of the this expansive adventure sometime before the end of the year. Thank you for your interest, encouragement, and support over the past 7 weeks or so. You have given me purpose–a reason to track and focus my thoughts–and I am very grateful for that. This entry was posted in Uncategorized and tagged beta city, Casco viejo, El Congrejo, energy, Energy shift, open, panama, Panama Canal, Panama City, Pedasi, South america, travel, universal, vulnerable, world city by servingothersblog. Bookmark the permalink. Next time you have to stop in Florida come up to St. Pete, Jonathan. I think you’d like it! ‘Expansive’! What a wonderful word for describing your amazing adventure, Jonathan! And ya, the car horns thing? Definitely jarring. Fun to experience something so different from home though. Thanks for sharing your adventure here with us! And while I have been away for too long, not knowing what to post about for returning, your Likes and support mean the world to me. Thank you. Be well, and warmest wishes for ongoing joyful adventures, home and abroad!